If you never caught the first post in the series of cemetery photos - click here to see what the series is all about. This place must have seen a great amount of sadness in its time but yet manages to be so beautiful. Isn't autumn lovely? 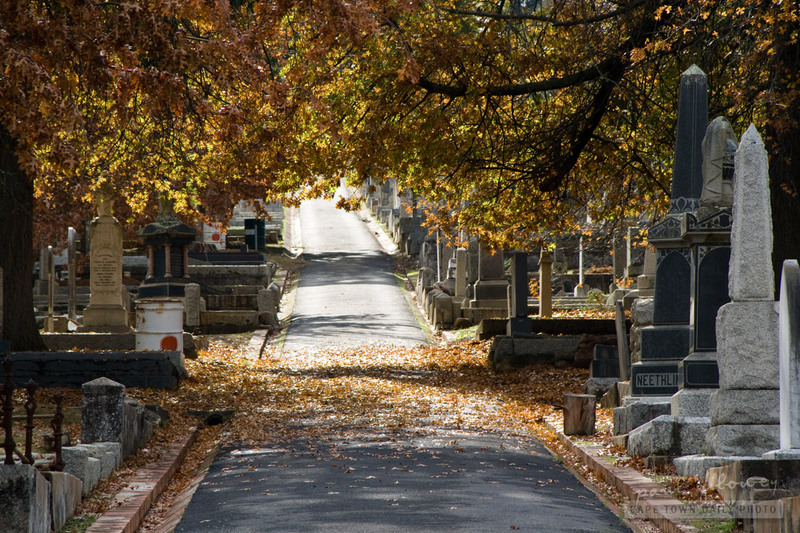 Posted in General and tagged autumn, cemetery, leaves, road on Wednesday, 1 June, 2011 by Paul. Wow, that is a stunning photo. I always think that autumn leaves on the ground look rather melancholy, and even more so in a graveyard setting. But still so beautiful. My name is Rica Buhner and I am PA to a very wonderful lady, by the name of Winnie Burger. Winnie’s brother-in-law has recently passed away and she has requested me to find out what options one has for the ash of a beloved, in the Gordon’s Bay, Somerset West, Strand or Stellenbosch area. Any sugges-tions will be welcome. I know you get something called a remembrance wall, but there must be some other options as well? •	Who do I call? •	Can one have a private memorial service afterwards? •	Maybe a quiet lunch afterwards at a nearby restaurant to remember all the good times? •	What will be the cost involved? These are some of the questions I can think of at the moment. Kindly assist me with some information if you can.